Are the Women of the Wall a threat to Israel’s survival? 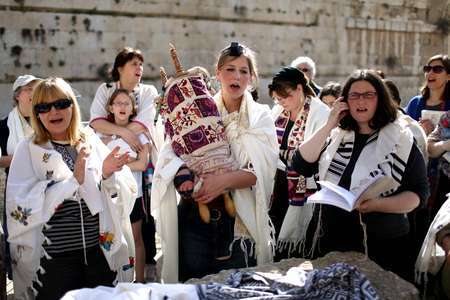 Women of the Wall — the end of the Jewish state? Sometimes our friends can be worse than our enemies. Our entire justification for having conquered the land from the former inhabitants, which we have done, is that it was God given to us. Otherwise, we’re just European colonialists who pushed out the indigenous people for no good reason other than the power of the gun. If we believe that God gave us the land, we must ask, what is our relationship with God? Do we bring anything into the relationship, or is the Gift from God argument, essentially, an empty slogan we don’t really believe in? If we believe in it, then we must accept that our relationship with God is through the commandments, more accurately through our adherence to His commandments — because that’s what He, in his eternal wisdom, told us. So that our adherence to halacha and our right to the land are inseparable, and if we don’t adhere to halacha, we have no rights here. Now, the most essential, most central, most crucial part of halacha is submitting to the yoke of our sages. In this case, there is one sage who is the state appointed administrator at the Kotel, and he laid down the law — only to be defied both by the WOW and by two lower courts. Incidentally — the high court still sides with the Rabbi of the Kotel. So, Dan Silagi, while I agree that your predictions are true, I also say that they make you and your ilk nothing better than the British and French oppressors of the black tribes of Africa, and that you, as a secular European invader devoid of justification for your occupation, must at once relinquish authority over the land to its rightful Arab owners. Now I would be the last to argue that God did not give the land of Israel to the Jewish people, but like many other gifts, it didn’t fall on us like manna. We had to earn it. And we, the Jewish people, did earn this one. In fact, even for those who don’t believe in God, the right of the Jewish people to the land of Israel is clear. There were Jews in the land of Israel since biblical times, although many were dispersed by the Romans, murdered by Crusaders, converted by Muslims, etc. Mark Twain visited the land in the mid-Nineteenth Century — before the arrival of the first Zionists — and found a desperately poor land, where Arabs and Jews lived under unspeakable conditions, ridden by disease and exploited by absentee Ottoman landlords. Yes, there were somewhat more Arabs than Jews — so what? The Zionists, as the cliché says, drained the swamps, reclaimed land that had been lost to agricultural use for centuries. They ultimately created industries and commerce. They turned wasteland into productive land and introduced modern medicine. These things benefited both Jews and Arabs. When the Ottoman rulers were replaced by the British there were further improvements. The British built rail lines and other projects, for which they imported Arab workers. The Palestine Mandate area became a magnet for Arabs from neighboring countries, especially Syria, where there was continuing political unrest and famine, and Egypt. Many — probably most — of today’s ‘Palestinians’ are descended from Arabs that came to Palestine after the 1880’s. Meanwhile, the Jews built the precursor of a state. They built roads, created health-care and pension systems, an army (well, more than one), established trade unions, and a ‘government’ which could negotiate with the British. The Arabs, most of whom were not ‘Palestinian’ nationalists but believed that Palestine was actually the southern part of Syria, followed a familiar pattern — anti-Jewish riots and terrorism. Their leader, al-Husseini, cooperated with Hitler and planned to establish extermination camps in Palestine after the German victory. As the mandate period wore on, the British more and more sided with the Arabs, culminating with the White Paper of 1939 which more or less entirely reneged on the promise by the international community to the Jewish people of a national home in Palestine. But despite this, and with the expenditure of much blood — about 1% of the Jewish population died in the War of Independence — the Jews kicked out the British colonialists and established the State of Israel. Of course I’ve left out a lot, including the flight of Arabs from the new state, the expulsion of hundreds of thousands of Jews from Arab nations and their ingathering to Israel, and Israel’s struggle to survive through several wars afterwards. But the fact is that God’s promise, if you look at it that way, was also embodied in international law and then made real by the labor, initiative and blood — a huge amount of blood — of the Jewish people, including secular ones. So with all due respect, Mr. Yanover, don’t sweat the WOW. The Jewish people can handle them, just like they can handle anti-Zionist Haredim and extreme leftist academics. This entry was posted on Wednesday, June 12th, 2013 at 12:30 pm and is filed under General. You can follow any responses to this entry through the RSS 2.0 feed. Both comments and pings are currently closed.